Ulcer Kit includes: 1 Stocking and 2 Liners. 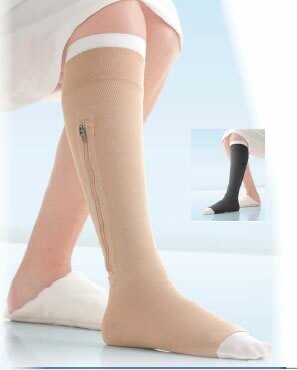 Two layer compression hosiery system for the treatment of venous leg ulcers. JOBST® UlcerCARE compression hosiery system consists of two components, a medical stocking with or without an outer zip and a compression liner. Together these provide a gradient of 40mmHg graduated compression at the ankle. The system provides an ideal solution for patients capable of changing their own wound dressings as the zip aids donning of the stockings. Designed for patient’s self-management and allows for improved hygiene, and minimal disruption to patient’s lifestyle, e.g., functional with normal footwear and clothing. The JOBST® UlcerCARE Compression Liner, as well as holding the wound dressing in place, also provides mild compression for non-ambulatory patients. This may be worn 24 hours per day to help manage lower leg oedema during bed rest.